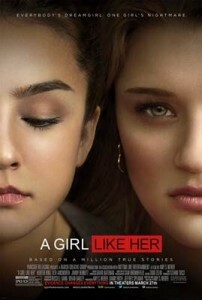 SoCal City Kid readers are invited to a Screening of A Girl Like Her. Ranked one of the top schools in the country, South Brookdale High School welcomes a documentary film crew on campus to chronicle the student body celebration. The camera quickly shifts focus from the pomp and circumstance of academia to the story of a victim and her bully in A GIRL LIKE HER. Jessica Burns (Lexi Ainsworth) is a 16-year-old girl with a secret she’s afraid to share with anyone, except her best friend Brian Slater (Jimmy Bennett). For the past year, she’s been victimized mentally and physically by one of the most popular girls in her class, a former friend named Avery Keller (Hunter King). With Brian’s help and the use of a hidden digital camera, evidence of Avery’s relentless harassment is finally recorded. But as Jessica begins to face her bully, she realizes her pain is stronger than her hope for things to change. When Jessica reaches a critical point and the film crew turns their lens toward the teen’s incident, Avery’s veil lifts during the documentation— revealing there truly are two sides to every story. Written and directed by Amy S. Weber, A GIRL LIKE HER is a poignant feature film that takes a realistic, inside look at bullying through the eyes of both the bully and the victim. Filmed unscripted and through improvisational technique, the film explores the connection and relationship between two individuals. In doing so it shines an unbiased light on the teen bullying epidemic and society’s role in breaking the cycle. With powerful performances from it’s young cast and its unique multiple perspectives, A GIRL LIKE HER reminds audiences what it means to listen in a world where emotional pain hides behind many façades. Credit: Parkside Releasing. No compensation was received to post.